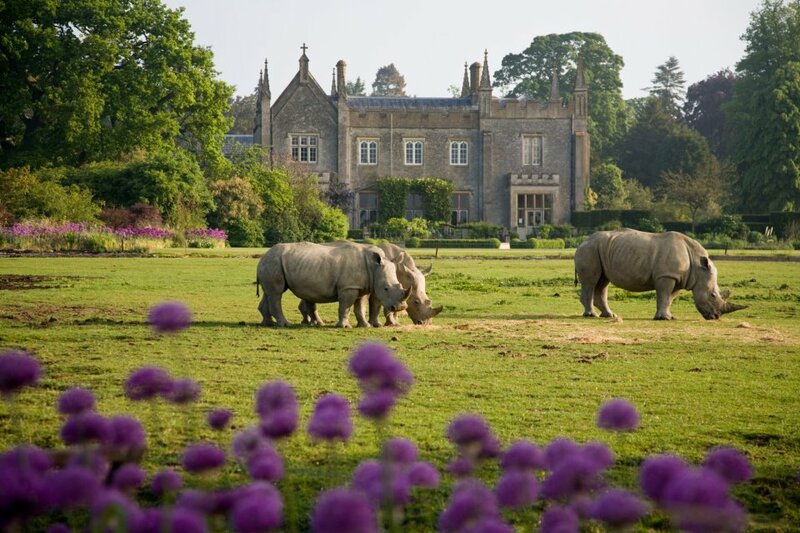 The Cotswold Wildlife Park & Gardens exhibits over 260 different species of animals and is the largest privately owned zoological collection in the UK. The Park is set in 160 acres (0.65 km2) of landscaped parkland and gardens 2 miles south of Burford in Oxfordshire, England. Around 350,000 people visit the park each year. The Walled Garden (behind the Gift Shop) houses aviaries, including a Humboldt penguin enclosure and a Tropical House with exotic plants and free-roaming sloths, and tropical birds such as Great Blue Turacos, Bali Starlings and Bleeding heart pigeons. Penguin feeding and talk is held daily at 11 am and 3 pm. Mammals in the Walled Garden include meerkats, yellow mongooses, prairie dogs and a breeding group of Oriental small-clawed otters. There is also a collection of small primates, including squirrel monkeys, pygmy marmosets, red-handed tamarins and emperor tamarins. In 2008, the Park opened “Madagascar”, a walk-through exhibit at the bottom of the Walled Garden which draws attention to the plight of endangered Lemur species.The mixed exhibit features ring-tailed lemurs, Collared lemurs, mongoose lemurs, Crowned Sifaka, Madagascar teal and radiated tortoise are also on show, and were brought into the collection especially for “Madagascar”. The breeding record of the lemur collection is very good with the ring-tailed lemurs giving birth regularly since their introduction in 2009, and the red bellied lemurs also having bred successfully. Lemur feeding and talk is held daily at 12 noon. A number of larger animal species from South America are here, including Brazilian tapir, capybara, Visayan warty pigs, Patagonian Maras and Giant anteaters. Canadian timber wolves moved into a wooded enclosure in 2006, with an undercover viewing platform. Other enclosures in the walk-through include white-naped cranes and parma wallabies.The entrance to the woodland walk is via a bridge over the lake, which has a wide variety of ducks and Chilean Flamingoes. Domesticated breeds can be found in the Children’s Farmyard. Large moated paddocks are home to a trio of Giraffe, a herd of Chapman’s zebra, a group of ostriches and breeding groups of white rhinoceros and Bactrian camels. Nearby are the Park’s big cat enclosures which house Clouded leopards and Asiatic lions. The Reptile House is a converted barn formerly used as stables, and is home to species such as Black mambas, Crocodile monitors, bearded dragons, poison dart frogs, and rhinoceros iguanas. The reticulated pythons, and anacondas are particularly large specimens. The Park achieved the first UK breeding for Morelet’s crocodiles in 2007 and with 12 eggs hatching successfully. Cotswold Wildlife Park is the only British collection to exhibit this crocodilian which is native to Central America. The Insect House is home to leaf-cutter ants, scorpions and tarantulas and other species of invertebrates. The Bat House holding Seba’s short-tailed bats, Egyptian fruit bats and Turkish spiny mice are in the Reptile Courtyard and nearby are enclosures for white-handed gibbons and siamangs. The Park is well known for its exotic planting, particularly in the favourable micro-climate of the Walled Garden where bananas and cannas are a speciality. The exotic birds and animals are complemented by flamboyant planting schemes. The South Terrace has been given a period feel although in fact the terrace, balustade and pond were constructed in 1989, thanks to a generous legacy from a regular visitor to the Park, Miss Daisy Louise Eley. By contrast, the planting around the West Terrace, in front of and around the restaurant is more contemporary. In May the front of the restaurant is draped in Wisteria flowers. The ‘Winter Garden’, between the owls and the Siamang Gibbons is planted with a wide range of perennials, bulbs and woody plants with an emphasis on providing interest in winter. Bamboo is a particular favourite at the Park, cut regularly for browse for the animals, of which they have planted over fifty varieties. The bamboo grows well here because of regular mulching of home grown rhino manure! There is prairie style planting around the rhino paddock to echo the African plains. The remains of a huge Cedar of Lebanon in the Adventure Playground, now supports the children’s tree house and slide.